To show the structure of oceanic crust and Moho around the eastern Ogasawara Plateau, we have analyzed industry-standard two-dimensional multichannel seismic reflection data. 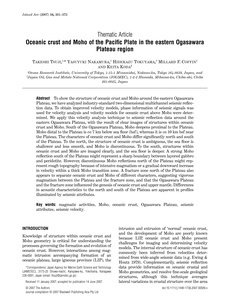 To obtain improved velocity models, phase information of seismic signals was used for velocity analysis and velocity models for oceanic crust above Moho were determined. We apply this velocity analysis technique to seismic reflection data around the eastern Ogasawara Plateau, with the result of clear images of structures within oceanic crust and Moho. South of the Ogasawara Plateau, Moho deepens proximal to the Plateau. Moho distal to the Plateau is ca 7 km below sea floor (bsf), whereas it is ca 10 km bsf near the Plateau. The characters of oceanic crust and Moho differ significantly north and south of the Plateau. To the north, the structure of oceanic crust is ambiguous, the sea floor is shallower and less smooth, and Moho is discontinuous. To the south, structures within oceanic crust and Moho are imaged clearly, and the sea floor is deeper. A strong Moho reflection south of the Plateau might represent a sharp boundary between layered gabbro and peridotite. However, discontinuous Moho reflections north of the Plateau might represent rough topography because of intensive magmatism or a gradual downward increase in velocity within a thick Moho transition zone. A fracture zone north of the Plateau also appears to separate oceanic crust and Moho of different characters, suggesting vigorous magmatism between the Plateau and the fracture zone, and that the Ogasawara Plateau and the fracture zone influenced the genesis of oceanic crust and upper mantle. Differences in acoustic characteristics to the north and south of the Plateau are apparent in profiles illuminated by seismic attributes.